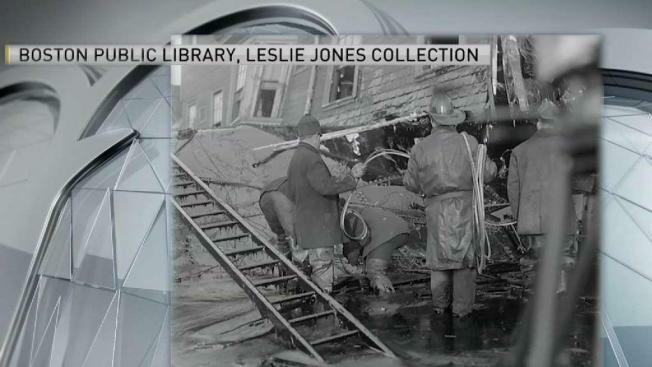 Tuesday marks the 100th anniversary of the great molasses flood in Boston's North End. Slow as molasses? This treacle didn't trickle. It was a sticky, deadly tsunami that flattened an entire Boston neighborhood within seconds. On Tuesday, the city marks the 100th anniversary of its most peculiar disaster: the Great Molasses Flood. It struck without warning at midday on Jan. 15, 1919, when a giant storage tank containing more than 2.3 million gallons of molasses suddenly ruptured, sending a giant wave of goop crashing through the cobblestone streets of the bustling North End. The initial wave rose at least 25 feet high — nearly as tall as an NFL goalpost — and it obliterated everything in its path, killing 21 people and injuring 150 others. Rivets popped like machine-gun fire. Elevated railway tracks buckled. Warehouses and firehouses were pushed around like game pieces on a Monopoly board. Tenements were reduced to kindling. "When you first hear of it, the molasses gives the entire event this unusual whimsical quality. The substance itself kind of begs some incredulity," said historian Stephen Puleo, author of "Dark Tide," a book about the disaster. "People's first reaction is, 'Are you serious? Did that really happen?' If it were fire or flood or famine or pestilence, this story would be much better known," he said. The tragedy struck as World War I troops were returning from Europe and Boston was still basking in a World Series victory by Babe Ruth's Red Sox. It ruptured in the city's oldest neighborhood, a district popular with tourists and locals alike for its warren of ancient streets lined with Italian restaurants and for its historical sites, including Paul Revere's house and the Old North Church. Those treasured landmarks were spared because they were uphill. "A dull, muffled roar gave but an instant's warning before the top of the tank was blown into the air," The Associated Press reported that day. Rescuers were "greatly hampered by the oozing flood of molasses which covered the street and the surrounding district to a depth of several inches and slowly drained down into the harbor. ... If a worker stood still for a minute he found himself glued to the ground." "Only an upheaval, a thrashing about in the sticky mass, showed where any life was," the Boston Post reported. "Horses died like so many flies on sticky fly paper. The more they struggled, the deeper in the mess they were ensnared." In 2016, Harvard University researchers published a study that helped explain the heavy loss of life. Two days before the disaster, the tank had been topped off with a fresh shipment of molasses from the balmy Caribbean that hadn't yet cooled to Boston's wintry temperatures. Once the gush of molasses hit the chilly air, it quickly thickened, complicating rescuers' frantic efforts to free victims. Purity Distilling's parent company, U.S. Industrial Alcohol, argued that anarchists active at the time must have planted a bomb that shredded the tank. But investigators concluded the tank's construction was faulty. A judge found the company guilty of negligence and ordered it to pay $300,000 — the equivalent of about $4.5 million today — in damages to victims and their families. "Back when that tank was built, the oversight was almost nonexistent," he said. "It wasn't just one thing. That's very common in big failures. It was all the stars, all the planets, lining up perfectly."